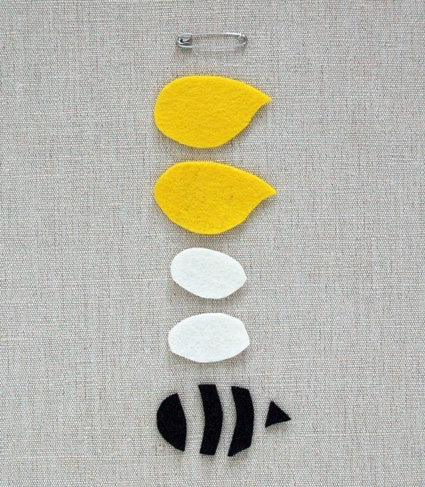 Embroidery Thread to match each of the felt colors. 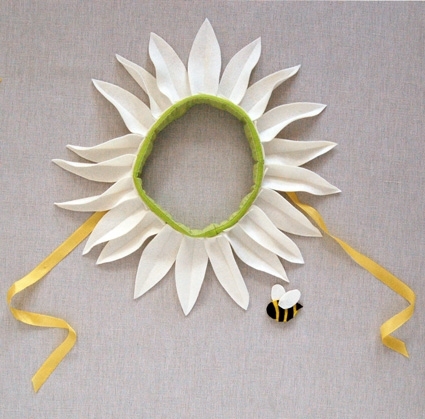 A Daisy and Bee template, available for free here, printed and cut out. I made my head dress to fit a child with a 19 1.4-inch face circumference, measuring from the bottom of the chin (where the chin meets the neck) and all the way around the edge of the face along the hairline. NOTE: To get yours to fit perfectly or to alter the size measure your child’s face circumference and then add 1 1/2-inch for the seam allowance to find the length of these first two pieces. 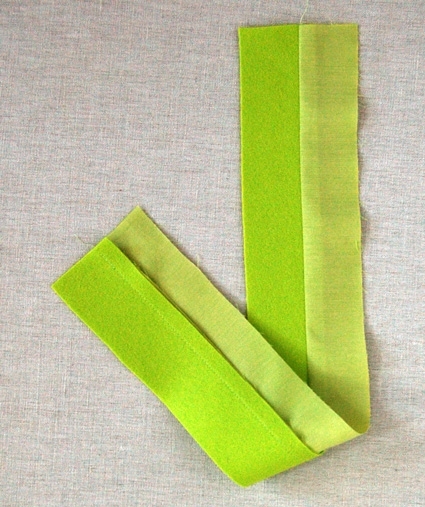 Cut a 20 3/4-inch x 1 3/4-inch strip from the lime felt. 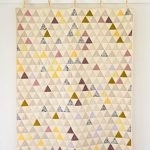 You will have to do this diagonally along the square of felt in order to get the full length. Cut a 20 3/4-inch x 2-inch strip from the Shot Cotton. 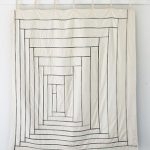 Sew the two strips together with a 1/2-inch seam allowance and press the seam flat. Set this aside. Using the tailor’s chalk mark as many petals from the daisy template as you can on the ecru felt using the petal template. 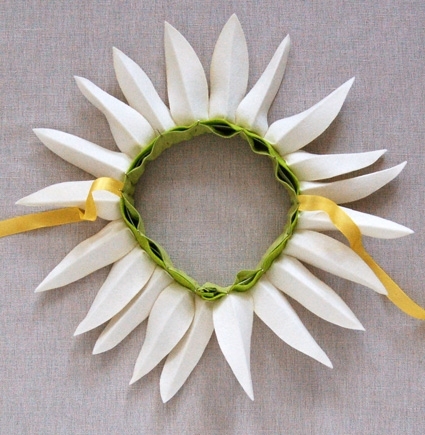 Make sure you have at least 21 petals (if you are sizing this project up you will want even more). 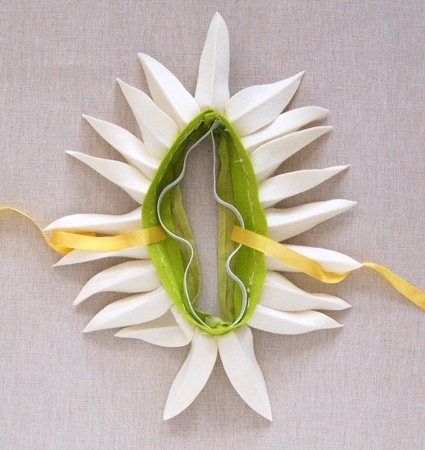 Cut out the petals. The top of the petal is the more acute angle, and the bottom is the more obtuse. Iron the petals in half lengthwise. Then cut a 1/2-inch deep slit down the middle starting at the bottom of the petal. 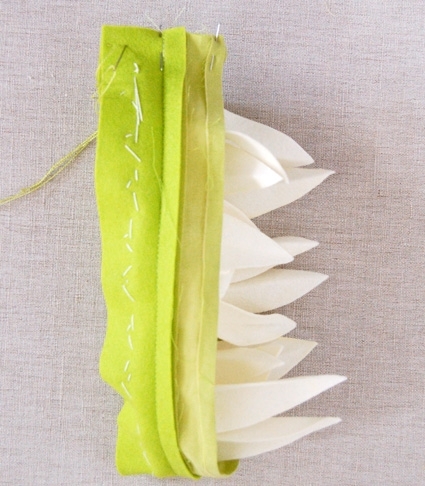 To make each petal stand up along the head dress when you sew them on you have to make a little fold at the bottom. 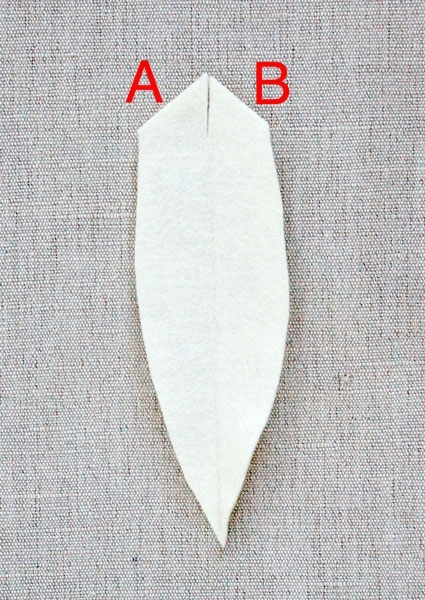 Do this by folding side A (as pictured above) so that it lays on top of side B.
Pinching the petal bottom fold together sew the petal onto the lime felt with a little “X” shaped stitch through it’s bottom, 1/2-inch from the edge of the felt and 1/4-inch from the seam where the felt meets the Shot Cotton, as shown above. Bring your needle up through the far side of the bottom of the petal and tack down the near bottom corner of the next folded petal. Then sew an “X” though the bottom fold just as you did for the first petal placing it 1/4-inch from the seam of the felt and Shot Cotton. 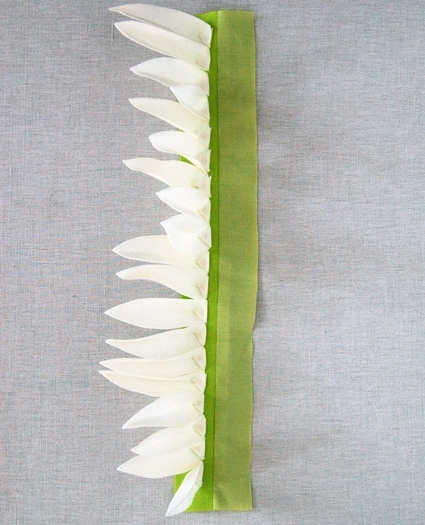 Attach all of the petals this way until are 1/2-inch from the next end. Turn your work inside out and press the long raw edge of the shot cotton 1/4-inch towards the wrong side. Pin the ends of the headband together, making sure not to pin any of the petals, and sew the ends with a 1/2-inch seam allowance. 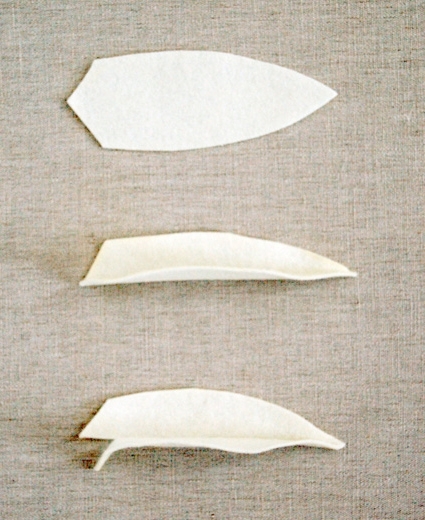 Once you turn your work right side out you may need to add another petal to cover up the seam. 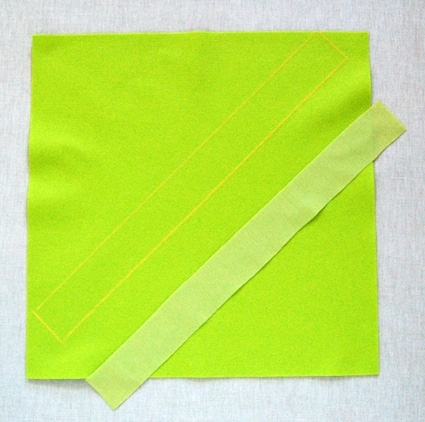 Cut the elastic to be 20 1/4-inches long and sew the ends together with a 1/2-inch seam allowance. 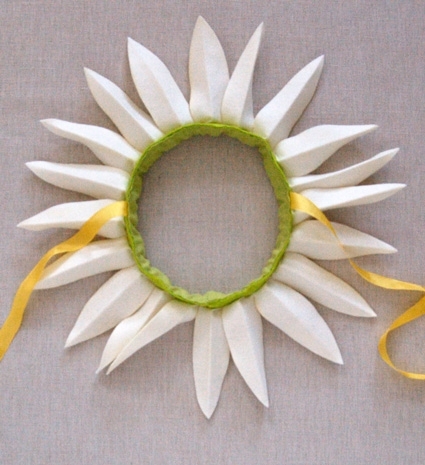 If you are making this in a different size cut the elastic 1-inch smaller than the face circumference. Cut the seam binding into two 17-inch pieces. With the head-dress’ open, unsewn side facing up, place the loop of elastic between the layers of the felt and shot cotton. 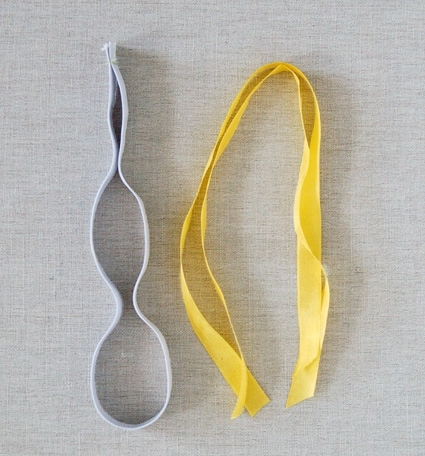 Put one end of each of the seam binding pieces between these layers as well, each 5-inches from the head-band’s bottom seam. 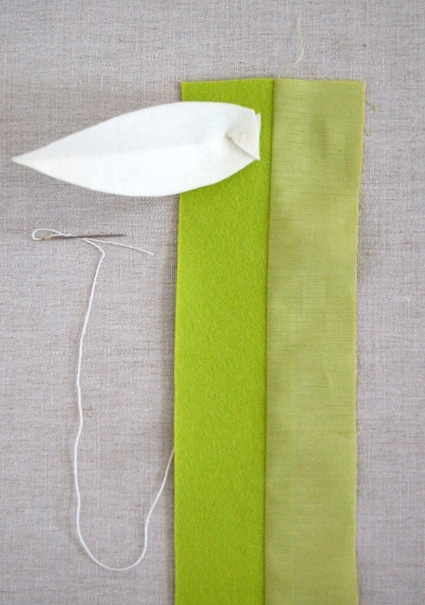 Pin the folded edge of the shot cotton to the lime felt all around the edge, thus encasing the elastic and the seam binding. 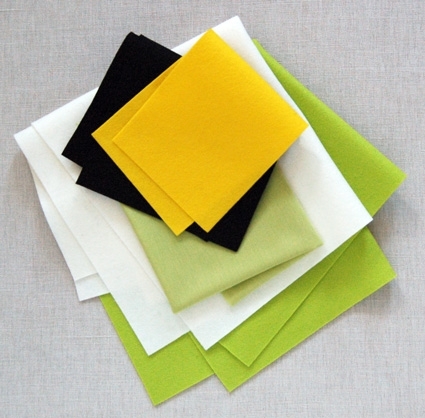 Using a small running stitch and lime green embroidery thread, sew the shot cotton to the felt with a 1/8-inch seam allowance. The head dress is done! 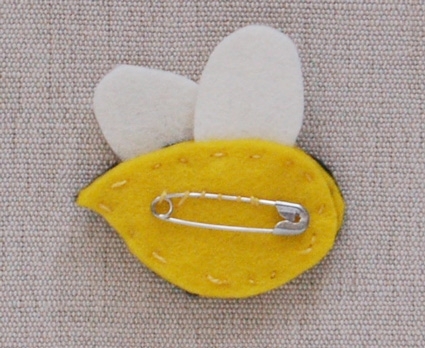 Sew the safety pin to one of the body pieces, with it’s stinger facing to the left. Sew the safety pin on only along it’s top arm, not through it’s moving arm. 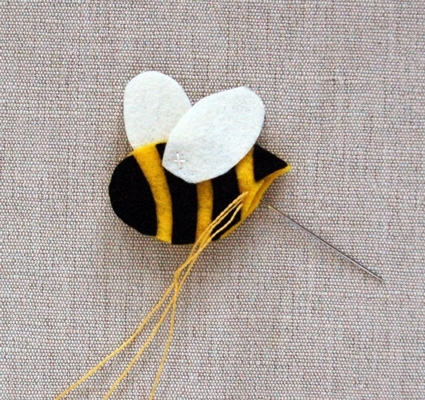 Sew the bee stripes onto the other body piece using a small running stitch and black embroidery thread. This body piece should have it’s stinger facing to the right. 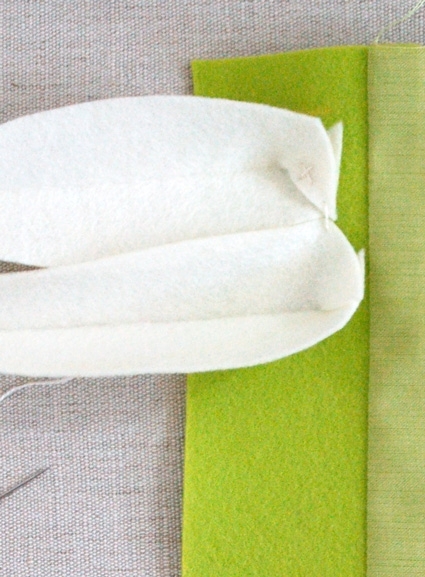 Using white embroidery thread sew the wings on to the striped piece with one in the front and one in the back as shown above. 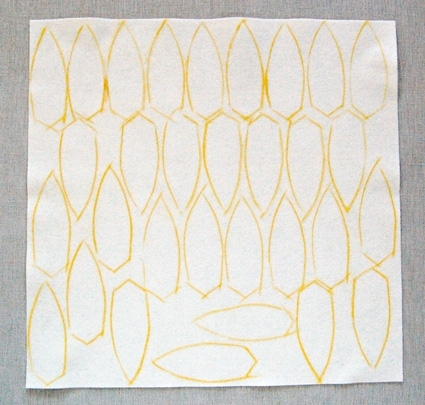 Sew the two body pieces together with yellow embroidery thread all along the edge. 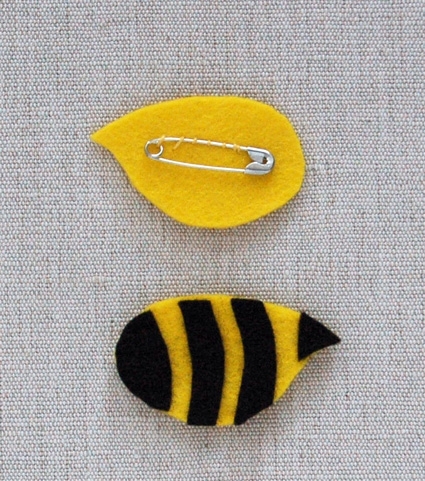 Sew under the black stripes and white wings so the yellow doesn’t show. The safety pin will be on the back when you’re done- ready to be pinned on! 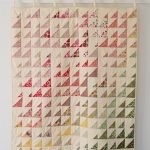 For the Love of Yarn, A New York City Yarn Crawl: Come Visit Us at Purl! 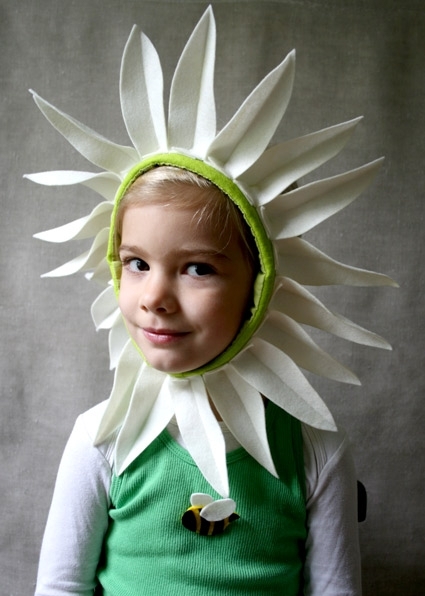 I posted a link to this briljant costume (as well as the bunny hat) on my blog. Hope you are ok with that? Thank you so much for this tutorial! I made 2 of these for my girls! I’ll post pictures on my blog this weekend. This is adorable. 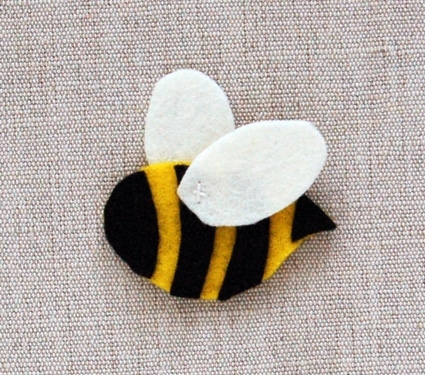 I found your site looking for bee pin for Halloween customer. The template is so helpful! Thanks much. Thanks for this post. 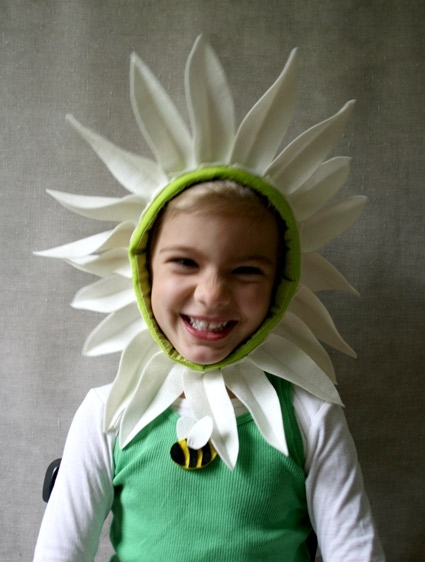 My son has to be a flower for a program in a couple of weeks and was wondering how to make the petals stand up. Now I know! LOL! Can I buy this Daisy headband off of you? I have a lot of testing and do not have the time or material to make it. If you could please let me know when you have time, I'd really appreciate it! 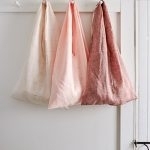 We don't sell any of the finished items on our site, just the materials to make them. I did the band with sparkly green felt and old gold brocade I had on hand. I skipped the elastic; found that the band fit around her face well enough as long as it was tied snugly behind her head. I also had to make sure my printer preferences were set to print the pattern pdf true to size, not shrunken to create blank margin widths. I thought the petal shape looked a little small when I first printed it! Thank you so much for sharing this darling picture! I hope the poinsettia and ghost had a great time trick or treating!